Make Every Print Count With HP Original Ink. HP Original Ink is specifically designed to rewrite the rules of printing, ensuring you always deliver professional colour documents and laser sharp text that leave a lasting impression. 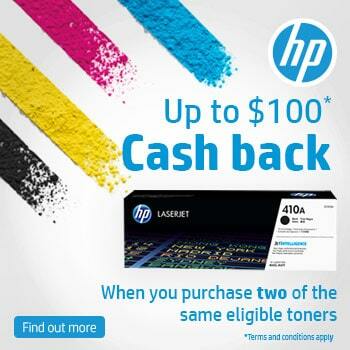 In one transaction, purchase any two eligible HP XL inks in the same group, during the Promotional period. Register your claim and submit your invoice as proof of purchase. When your claim is verified, the amount will be paid directly into your nominated bank account by EFT. See Below for a list of eligible products and the Cashback value. “Eligible Product” means each of the HP-branded produces listed in the column “Eligible Products” in the table below. This promotion is only valid on eligible individual ink cartridges and excludes multi-packs, combo-packs and mega-packs. “End-User” is a Participant who purchases two (2) Eligible Products within the same Group from a Participating HP Reseller or HP Direct for use in Australia and not for resale, re-supply or export. “HP Direct” is a direct sales arrangement between the End User and Promoter including via the HP Online Store in Australia. 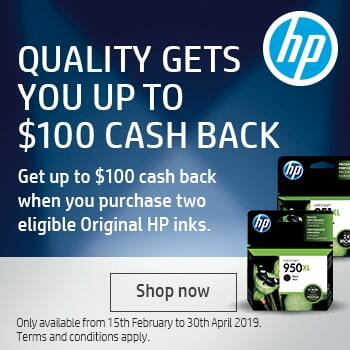 “Participating HP Reseller” is a reseller authorized by the Promoter to sell the Eligible Products in Australia who has agreed to participate in this promotion. “Participant” means a resident of, or business trading in, Australia who purchases an Eligible Product from a Participating HP Reseller or HP Direct during the Promotional Period and is the End User of that Product. The Promoter, its related bodies corporate, resellers of HP products and any agencies associated with this Promotion, their employees and those employees’ immediate families are ineligible to participate. The “Promotional Period” commences at 09.00AM AEDT 15 February 2019 and ends at 05.00PM AEST on 30 April 2019 (“Promotional Period”). All entries must be received by 5.00PM AEST 14th May 2019. Participant(s) will forfeit claims not made by this date. The “Reward” means the cashback reward corresponding to the relevant Group of Eligible Products in the Table below which will be delivered to each successful Participant via electronic funds transfer. There is a limit of three (3) entry redemptions for each Participant. Information on how the enter this Promotion and Reward Redemption details form part of these terms and conditions. By submitting an entry, the Participant agrees to these terms and conditions. Entry is only open to a Participant. The Promoter reserves the right to verify the validity of each entry, including whether the entrant qualifies as a “Participant”. The Promoter reserves the right to disqualify and Participant or person tampering with the entry process or any entrant who does not meet the eligibility requirements or does not comply with these terms and conditions. 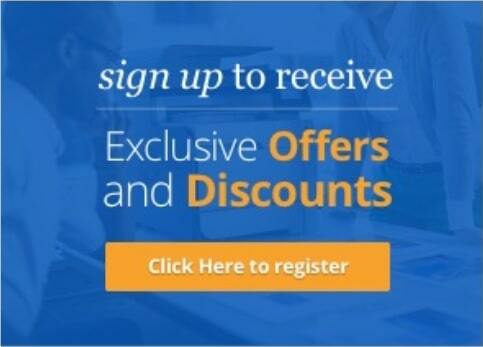 Provide the following correct details in the online Promotion entry form: End User (customer) first name, End User last name, Eligible Product part number, Eligible Product serial number, Quantity, Purchase date, Reseller name, Total invoice value, Invoice number and the supporting tax invoice to the Promotion website at http://www.hp.com.au/inkcashback as a PDF, JPEG or other supported file type using the document upload facility that will be provided at the website. The Participant must correctly and fully complete an official online claim form at http://www.hp.com.au/inkcashback with all required information by 5.00PM AEST 14th May 2019. Hand written tax invoices and delivery dockets will not be accepted as proof of purchase. Any claim form submitted without the required proof of purchase documentation will be rejected. Participants with a valid claim form will receive the corresponding Reward for each complete Group of Eligible Products purchase, up to a limit of three (3) entry Reward redemptions for each Participant. If more than three (3) redemptions are submitted, the Promoter will consider the Reward in the order that they are received by the Promoter. The Promoter will accept no responsibility for late, lost or misdirected mail. Further, TO THE EXTENT PERMITTED BY LAWS of AUSTRALIA, the Promoter excludes liability for any problems or technical malfunction for any telephone network or lines, computer online systems, servers, or providers, computer equipment, software, technical problems or traffic congestion on the Internet or any website, or any unauthorised intervention, or any combination thereof, including any non-delivery or corruption of entries to the Promoter, injury or damage to participants’ or any other person’s computer related to or resulting from participating in or down-loading any materials in respect of this Promotion. The use of any automated entry software or any other mechanical or electronic means that allows a Participant to automatically enter repeatedly is prohibited and will render all entries submitted by that Participant invalid. If the Promoter has not entered into any correspondence with the Participant prior to the last mail date of the Promotion, it is the responsibility of the Participant to contact the Promoter to ensure their claims has been received and/or has been verified. The Promoter reserves the right to extend the closing date of this Promotion or amend the terms at its discretion. The Promotion is not valid in conjunction with any other offer or promotional product bundle. Entries will be deemed invalid if the same tax invoice number is used on more than one entry. The Promoters decision on all matters pertaining to this Promotion is final and binding and no correspondence will be entered into, except as otherwise stated in these terms and conditions. No correspondence will be entered into after 6 week of closing date of this Promotion. Redemption of the Reward will be made by way of electronic funds transfer. Participants must provide correct bank account and contact details before the Promoter can release funds. Claims are not transferable or assignable. Only the Participant who purchased the Eligible Products may submit a claim. Once claims have been received and verified please allow up to approximately 75 days for receipt of the Reward. The Promoter does not accept any responsibility for misleading or incorrect information provided y a reseller regarding this Promotion. Liability for tax on any prizes provided to Participants pursuant to this Promotion shall be the sole responsibility of the Participant. It is recommended that Participants should contact their own accountant or taxation advisor in this regard. The Promoter shall not be liable for any loss or damage whatsoever which is suffered (including without limitation, indirect or consequential loss), or for a personal injury suffered or sustained, as a result of participation in this Promotion, except for any liability which cannot be excluded by law. The laws of New South Wales, Australia apply to the Promotion to the exclusion of any other law. Participants submit to the exclusive jurisdiction of the courts of New South Wales, Australia.